I met my guardian angel (again). He (or she) disguised herself as an old cab driver. We talked like old friends. After another heartbreak, I decided to take a short holiday, a weekend getaway to anywhere outside the island. So i found this ad online 2 weeks ago, the host offered a 1 night trip to Bintan, Indonesia, with Pilgrimage to Grotto of Mary Mother of Perpetual Help. I signed up immediately without second thought. Lesson learned here, don’t make any decision when you can’t think clearly. Don’t rush into making decision when you’re under stress. 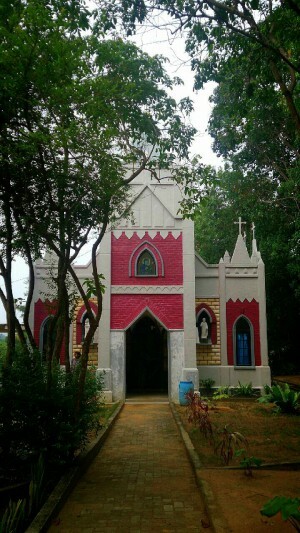 #LittlePilgrimage #36 Kapel St. Petrus (Chapel of St. Peter), Teluk Dalam – Pantai Trikora (49 km dari Tanjung Pinang), Kab. Bintan, Kep. Riau, Indonesia. 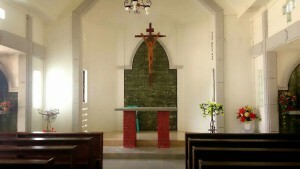 The driver from the Hotel took us to the Chapel, about more than 1 hour from Tanjung Pinang. It was more like forested village area. The Mass started about 5 minutes after we arrived at the Chapel. We soon took a seat and follow the Mass. 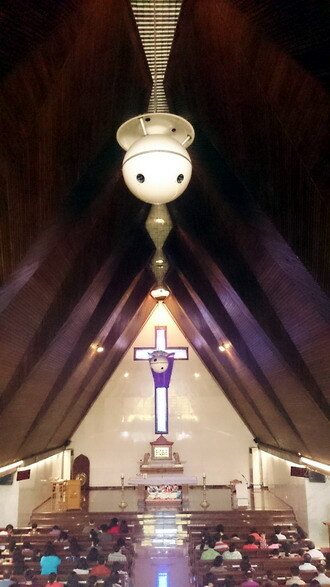 This was my first time attend a Mass in a very small chapel, in the middle of nowhere. One good experience for me. I feel so blessed to sit around them, and feel so grateful that someone built this chapel for the locals to gather and praise God every week. 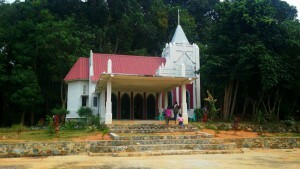 This mini chapel located in the middle of a forested area. Outside the chapel, there are the 15 ways of the Cross. Yes you heard it right! They put one more extra for us to remember how Jesus suffered and finally rose from the death. The famous Grotto of Mary Mother of Perpetual Help was apparently not-so-famous among the locals. And I have to admit that it was such a pity to not doing any maintenance properly for this Pilgrimage Site so more tourist can enjoy their religious trip. But I do enjoy to be around the nature. 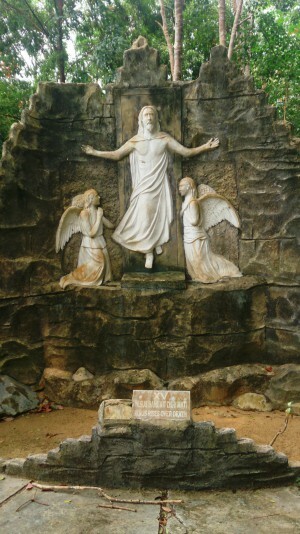 I cherished myself during my religious trip to this small village around the forest. And this Pilgrimage site has reminded me of another Pilgrimage site I went many years back in Cirebon, West Java, Indonesia. Maybe next time I can revisit that site and post it on my blog. Anyhow, after the Mass and follow the 15 ways of the Cross downward back to the entrance, we went back to the hotel. Long story short–the host tricked me and I paid two and a half more expensive than what’s necessary in total. I was too tired of being tricked and lost this amount of money by a stranger disguised as a nice lady, in my own country. I just wanted to go home and have a good rest. But the taxi queue was very long at the terminal, so I decided to take the bus back to Tanah Merah MRT station, then take a cab from there. Instead of grab those random empty cabs passing me by with their green lights, I just–somehow–wanted to grab a cab from my application, instead of stopping them. Finally this old cab driver with number 710 called Mr. Ong, answered my call. As I was trying to be a nice passenger to the driver, I told him I just finished my short holiday in Bintan. Then I realized I couldn’t hide my disappointment of what just happened during the holiday. But since I didn’t think it’s necessary to bad mouthing about someone, so what I told to the old driver was just “I can’t believe my friend tricked me for my holiday.” But what the driver answered me was surprised me. He didn’t ask me back like, “how do you know this friend?” or “how much did she trick you?” or “what is the nationality?” or what ever kepo question the normal people here would ask. What he answered me was something like, “that’s okay Miss. It’s no use to keep your anger towards someone else’s fault. Don’t let it bring you down.” He didn’t blame me for not being cautious, he didn’t blame her for conning me. Then we talked about other topics. It seemed like the nice cab driver was trying to distract my bad mood into a nice and friendly conversation. It also seemed like he knew what topics interest me. We talked from politics, to my job, to sg life, and I found it strange and amazed me how we talked like old friends. And then we talked about the rich and the poor and the gap between them, and then he asked me, “you don’t like about this gap, right?” It was literally like we are old friends, he followed my facebook and he knew me so well. And it was also surprised me how he literally lightened up my mood with a very enjoyable conversation, and not just a light chit chat between a cab driver and a passenger who has just met. The second time I somehow brought our conversation back to the incident I just had, once again the cab driver told me, “You know what Miss. Sometimes, this kind of thing must be happened in our life so that we can learn something. And there’s nothing much you can do. All you have to do is just accept it and move on.” He didn’t even quote from anyone, we didn’t even talk about religion, but everything he told me was all correct and somehow calmed me down. When we finally arrived at my condo, being a polite person I told him, “good night sir, it’s been really nice talking to you.” Because that was exactly what I feel. I’ve been in hundred cabs before, but tonight was the first journey I enjoyed it very much, I felt so lightened up because of the friendly conversation with him. When he replied me, “It was nice talking to you too, Miss”, it sounds like a polite reply. But when he turned to me and smiled at me and said, “have a good rest,” I suddenly feel so much calm and the bad mood vanished. I’m quite sure that wasn’t humanly smile. I reached my room and cried after I realized how God taking care of me during my trip. And even after all that incident happened, the hotel staffs treated me very nice like helping friends. The nice and friendly conversation with the cab driver was the most knocked me to the heart. I can feel the warmth of when I’m talking to a wise best friend. I believe I had an unforgettable conversation with my guardian Angel. I believe this time my guardian Angel just wanted to help me and cheer me up after the incident. I believe he (or she) disguised herself as an old cab driver. since i went for business trip on thursday-friday last week, so i was thinking to extend it until sunday. and good thing is, my friend’s place was located walking distance to this church. i know i–made excuses that–didn’t have time to attend the Mass, so i just had my quick stop and pray for less than 10 minutes, then i left. i did feel like a tourist in my own home country. but God has his own way to make me not skip the Mass. just today, 2 days later after my quick visit at Gereja St. Yohanes Penginjil, God dragged me to St. Joseph Upper Bukit Timah Church to attend weekday Mass there. funny. just so sudden this girl showed up in the same elevator with me at the office, and she told me she’s going to church and ask me to go with her (without asking me whether i want anot). anyhow,, i never reject the invitation to go church. so i think this is the way God makes me laugh. anyway. i found this beautiful paintings of Mother Mary dressed in local javanese kebaya (costume) by a famous artist, F Widayanto, which is very very beautiful and represents the local beauty very well. too bad this painting has reflection glass and this is the best shot i could get–sorry about that. i went back to my home-country : Indonesia, this week. 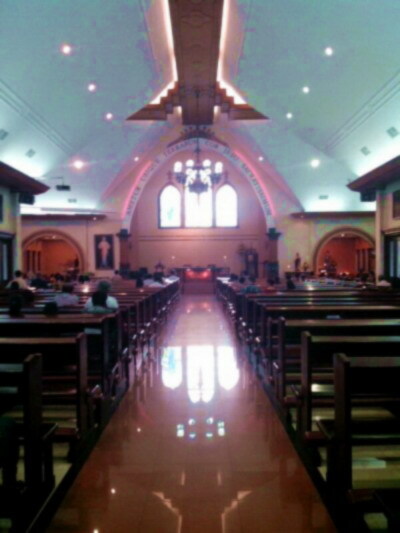 i stopped by at Gereja St. Theresia (Church of St. Theressa) to have a Mass there. 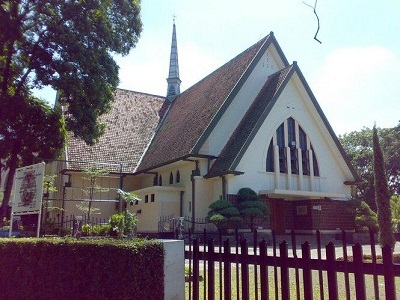 anywho, i found this exterior pic from google, and amazed how small this church looks like. becayse it was actually bigger than you saw on this pic. the interior was so simple, with the holy cross located not in the exact middle of the altar, and saint Theresia was standing at the right-hand side of the altar. 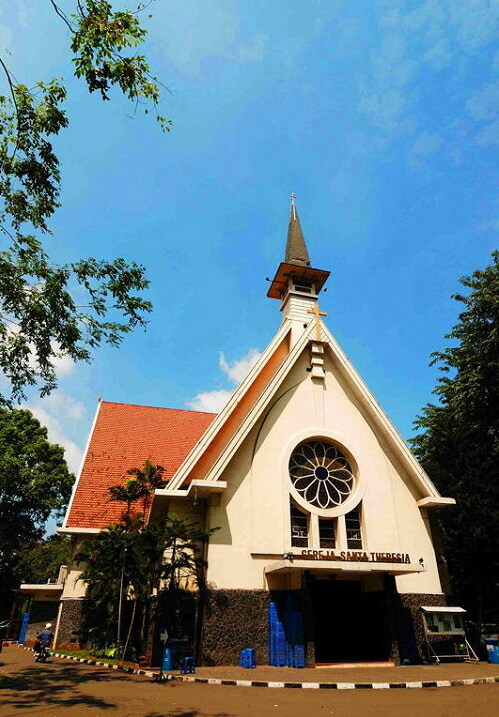 i can say that this is one simple church located in the middle of nice neighborhood in Jakarta. and i don’t mind to go there everytime i touch down Jakarta. interesting point of this church? well–i can say there’s a nice ayam goreng tulang lunak near this church! 😀 and it’s located near sarinah shopping center. :’) there’s also a nice shady and quiet Mother Mary’s garden at the side of the church. since i went back to my hometown,, i didn’t do my little pilgrimage in singapore. instead,, i did it in my hometown. #LittlePilgrimage 32. 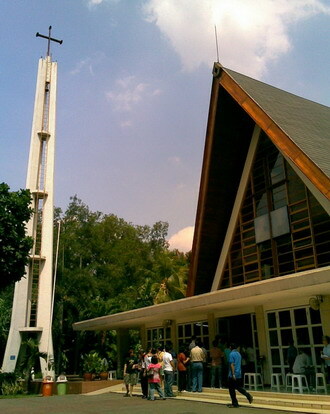 Gereja Hati Kudus Yesus, Jl. Kapten Ismail No 128 Tegal, Indonesia. did i tell you about people in my hometown bulldozed the whole church to the ground and built a new one? i missed the “church” feelings i get when the old church was still there. the new building looks much much more fancy. it clearly shows how rich the catholic people here are. how they really want to boast about. i remember the first time i stepped in to this new building (5 years ago? ),, i almost felt like take off my shoes (you know–it’s a kinda old tradition to take off your shoes when you were entering a rich people’s house, because we don’t even want to put one single dust on that place). 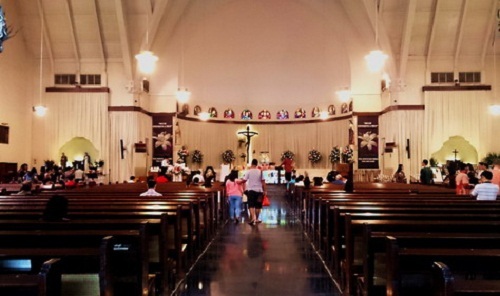 i remember the old church, there were quite a lot of old people came for the weekly mass with their old clothes, some were look so poor. now with this new arrogant building, i couldn’t see poor people come in for the mass. they must be in doubt if they allowed to come in or not. must be in doubt if this fancy building are made for everyone. because now people are dress up for the mass. shiny floor, polished benches, a lot of aircon, fancy ceiling, copper chandelier,, how fancy. how cocky. is a church something you want to boast about? ?